"Watchful Wolves Personal Checks" product is already in your cart. Watchful Wolves Personal Checks feature these wild and beautiful animals in a variety of forested settings. Because wolves can be found on most of the continents in the Northern hemisphere, wolves are often found in cultural mythology. Native American culture sees the wolf as a good animal, honored for their wisdom, intelligence, loyalty and courage. Medieval European cultures portray the wolf as evil. The truth is that a wolf is not good or evil; they are predators that help to keep the natural balance in place. 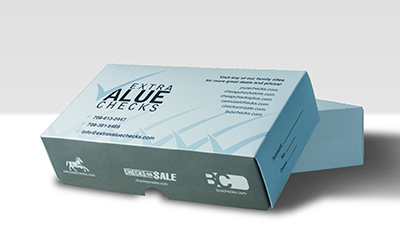 Watchful Wolves Personal Checks are available in single and duplicate check format. Matching address labels and a coordinating checkbook cover are also available.